The quality of Cybex exercise bikes is well-known among health clubs and other fitness facilities. With few repair issues ever and solid quality construction, it’s no wonder that Cybex equipment was chosen for the cardio training workouts on The Biggest Loser TV program. The company was founded in 1973 by Edward Trotter. In 1997, the well-regarded Trotter brand merged with Cybex International, Inc.
Today Cybex is a leading manufacturer of light and full commercial exercise equipment including cardio and strength training machines. The cardiovascular equipment includes exercise bikes, treadmills, steppers, and the award-winning ArcTrainer. Cybex products are currently in use in homes, health clubs, corporate fitness centers, colleges, and pro sports teams training facilities in more than 80 countries around the world. The company headquarters and production facility are located in Medway, Massachusetts, which is also the location of the Cybex Institute for Exercise Science, a state-of-the-art training center for athletes, trainers, employees, and customers. 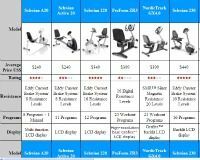 Although Cybex bikes are pricey for home users, keep in mind that these are essentially the same machines you'll find in a health club setting. You have four recumbents to choose from: the 525R, 625R, 770R and the Total Access Recumbent Bike. You also have four uprights to choose from: the 525C, 625C, 770C and Total Access Upright Bike. They range in price from around $3000+ or so for the 525 series to $4000+ for the 770 series. 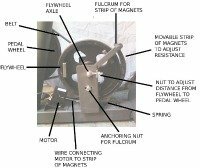 There are also upgrades for all models that can raise the price several thousand dollars. The Cybex upright exercise bike has a welded frame and mountain bike crank, multi-position handlebars, contact heart rate grips, and an optional Personal Entertainment Monitor that turns itself off to save energy and extend the life of the monitor. The recumbent offers an incredible range of resistance thanks to a self-tensioning drive belt. Any rehab patient can start out with the least amount of resistance at about 20 watts, while the level goes up to a heart-pounding 900 watts for intense training by very fit individuals. Cybex products have a strong following among fitness trainers and health club customers who give the company universally positive reviews. The low maintenance, highly durable construction and design means the cardio products are built to last a long time. Cybex exercise bikes help you get fit faster and do it more comfortably. Like their treadmills and the Arc Trainer, the bikes are engineered using exercise science to reflect the natural movement of the human body. Cybex 770C Upright - A high end club quality model with three different modes of operation accommodating all levels of users. 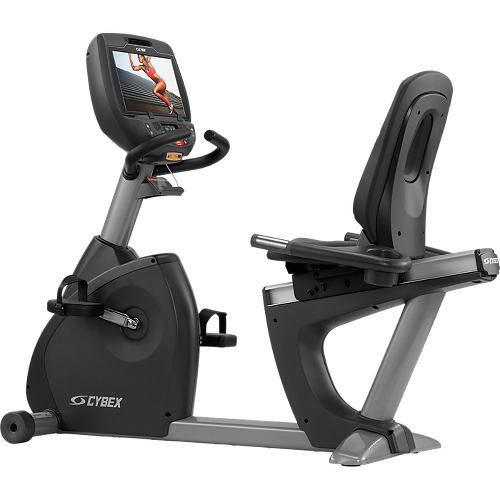 Cybex 770R Recumbent - The sister model to the 770C, this one offers the same features and capabilities, perfect for all fitness levels. Cybex Remanufactured Cyclone 530r Recumbent - An older version of the company's current recumbents; very popular with physical therapists and physical rehab centers. Cybex Remanufactured Cyclone 530c Upright - The Cybex 530c has been discontinued, but it lives on in some gyms and many private homes as a refurbished or remanufactured marvel of durability. Cybex Remanufactured 700r Recumbent - A top quality commercial grade machine for in home use at a significantly lower price than a new model. Cybex Remanufactured 700c Upright - A commercial grade model that includes a nicely padded, adjustable, pneumatic bike seat; well worth the price, will last for years. Cybex 750r Recumbent - This bike delivers superior comfort, reliability, durability and performance for heavy use all day every day. If money is no object for your home gym, this bike is the best. Cybex 750c Upright - This is the same bike that is sold to health clubs and rehab clinics for heavy use by multiple users. It will serve you flawlessly in your own home gym.